I find that one question comes up over and over again when I work with intermediate level climbers...and it's not, "where can I get a cool minivan with Cheerios mashed into the floor and preschool age car seats like that?" Or, "where can I get an awesome pair of pants with holes in the knees like that?" No, instead it has to do with carabiners. And it has to do with cordelletes. Some climbers clip each independent piece to a cordellete with locking carabiners. They then tie off the cordellete and clip into the powerpoint with locking carabiners. When asked to explain their decision, they usually come out with some rendition of, "it's safer." It is perfectly fine to use non-lockers on each independent piece. This is because most traditional anchors have three or four pieces in them. There is redundancy in the system because you have clipped all three or four pieces. I can already hear the chorus. "But what about sport anchors?" It is absolutely fine to use two non-lockers on bolts or chains clipped to slings or draws, which then have lockers at the powerpoint. Lockers are life-points. In other words, if you are clipped directly into something, it should be with a locker. If there are a lots of carabiners in the system, clipped to lots of things, then there is redundancy. Prior to working as a mountain guide, I was a high school teacher with a lot of free time in the summer. The free time was great. I definitely got out and climbed as much as I possibly could. But I also had the time to pick-up a part-time job in the mountains. Needless to say, we had a lot of bear encounters. In Southeast Alaska, we averaged one to two bear encounters a day. Most of the time, you would see a bear fishing in the creek nearby. A loud yell, a hoot or a holler was usually more than enough to scare most up into the woods. Most didn't want anything to do with us. Many backcountry users carry pepper spray. It is important that you know exactly how the spray works before using it on an animal. Practice with it before carrying it. And never use it unless you believe that your life is in jeopardy. There are some obvious physical differences between the American Black Bear (Ursus americanus) and the Grizzly Bear (Ursus arctos horribilis). Color, however, is not a reliable identifying characteristic for either species. 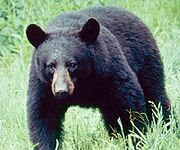 Not all black bears are black in color; they come in a various shades of brown and may even be blonde. 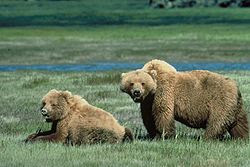 Grizzly bears range from yellowish-brown to black. When looking from the side, a black bear has a straight facial profile (from the forehead to the nose). The same profile of a grizzly bear will have a dished out appearance. Also, a black bear will have a straighter shoulder-rump line, while the grizzly will have a characteristically large hump on it's back above the shoulders. The black bear has claws which are shorter and more curved than those of the grizzly bear. Denali Park, AK: Denali National Park and Preserve officials confirm that a solo backpacker was killed by a grizzly bear along the Toklat River the afternoon of Friday, August 24. A wallet with probable identification of the victim was found near the kill site, and NPS rangers are working to make positive confirmation and notify next of kin. Friday afternoon, three dayhikers first discovered an abandoned backpack along the Toklat River approximately 3 miles south of the Toklat River Rest Area. Upon further investigation, they saw evidence of a violent struggle, including torn clothing and blood. They immediately hiked back to the rest area and notified the NPS staff of the findings at approximately 5:30 pm. Park rangers launched a helicopter and a fixed wing aircraft from park headquarters at 8:00 pm. Searchers on the aircraft located the scene at 8:35 pm. At least one grizzly bear was still at the site, although there may have been multiple bears. The bear(s) moved away when the helicopter approached and landed. Two rangers on board the helicopter got out and confirmed the location of the victim’s remains. 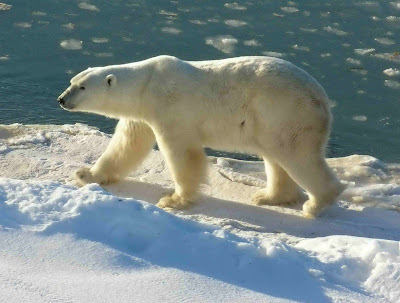 Initial evidence indicates that the attack occurred proximate to the river’s open braided gravel bar, although the bear subsequently dragged the remains to a more secluded, brushy cache site. After conducting an initial surveillance of the site, the rangers determined that the recovery of the remains would need to wait until daylight due to the presence of bears and the waning light. Park officials believe that there are no other registered backpackers in the immediate vicinity. An emergency closure has been put in place, prohibiting all hiking and camping in that backcountry unit until further notice. Park rangers returned to incident scene on Saturday morning, August 25, to secure the site, recover the remains, and attempted to locate the predatory bear. Wildlife biologists estimate that roughly 12 grizzly bears have been residing in the vicinity of the kill site this summer. More details on this fatal incident will be released as the investigation continues. The Green Creek Glacier, found just south of the South Twin in the Twin Sisters Range, is an alpine rock playground with most routes clocking in as mid-fifth class “adventure climbs.” These are adventure routes because while the trailhead is no more than thirty miles from Bellingham, the approach is serious and only hardy climbers should make the trek into region. I recently made my first foray into this region and found it to be an incredibly cool area. And in part it's cool because it is truly a wilderness area. Indeed, the approach requires a bunch of bushwacking and wilderness navigation. The area is also cool because it is home to the "Bellingham Big Wall." For a number of years people referred to this as the Mythic Bellingham Big Wall, so when ascents finally began to take place on the wall around 2005, primarily pioneered by Darren Berdinka, the wall was dubbed the Mythic Wall. There are a bunch of routes in the area, some older, some newer, but as I'd never been to that part of the Twin Sister Range, I thought it might be worth checking out. 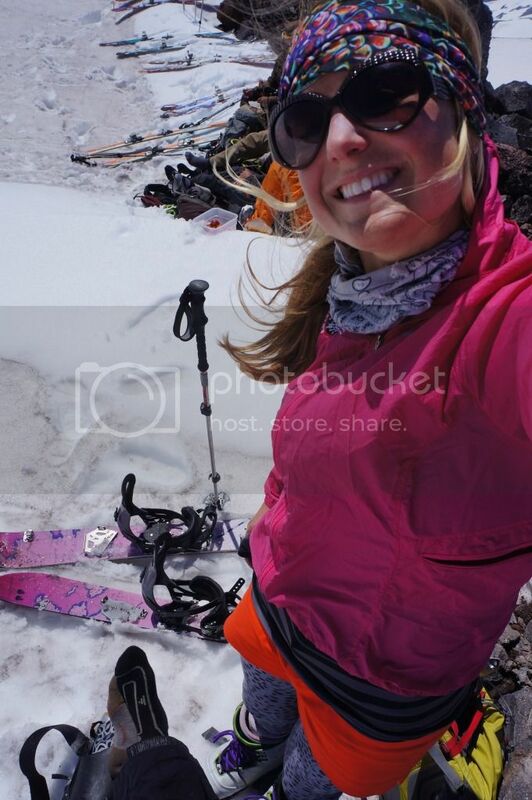 Strong parties can do routes on the Green Creek Glacier in a day. But strong doesn’t necessarily mean “I’m a good rock climber, so I should be fine.” Instead, strong means that you can hike fast, navigate through nearly impenetrable brush quickly, and then climb quickly. Most parties should plan on two days or more in the region. There are a few things that you should consider before heading into the Green Creek Glacier. First, it’s probably not even worth it in a month outside of July, August or September. The creek crossings will be too difficult. Second, it should be completely dry out. If there is any light rain, mist or even dew, you will get soaked to the bone while fighting through the brush on the approach. And third, the climbs in this region, while on somewhat sound rock, are still alpine in nature and many of them have seen limited ascents. It took us a long long time to get to the base of our route. We left the car at 6:30 in the morning and got back to the car at 8:30 at night...and we only did a three pitch route. Though it was an awesome day in an awesome area. Crossing the Middle Fork of the Nooksack. On the way back, water was running over the logs and we had to crawl across them on our hands and knees. There was a lot of map and compass action on this approach. There were two major creek crossings that required us to search around for a suitable way cross. This was the second, over the Greek Creek. Our first views of the Green Creek Glacier and the peaks behind it. As we moved up onto the glacier, the views continued to improve. After our approach took so long, we decided that we would not climb one of the bigger walls. We opted for the Green Creek Needle, the spire just left of center. My partner, Dave Zulinke, leading a 5.4 pitch on the Needle. Dave working his way up the last pitch of the Needle. Dave, after a successful ascent of the Green Creek Needle. From Bellingham, drive SR 542 east toward Mt. Baker for 16.7 miles. Turn right onto Mosquito Lake Road and drive 4.7 miles to the Middle Fork Nooksack Road (FR 38). Follow the road for 11 miles to the Elbow Lake Trailhead (2,100’). Take the Elbow Lake trail to the Middle Fork of the Nooksack and find a way to cross. This is the first of two difficult crossings on the approach. You should be willing to bail on the whole trip if the water is too high on either crossing. Once you are on the other side of the river, pick up the Elbow Lake Trail again and walk for approximately 1.5 miles to a switchback at 2,650’. It is mildly steep as you leave the trail and enter “the bush.” Traverse down southwest to 2,600’ to cross Hildebrand Creek. This is an easier crossing. Climb out of the drainage and continue to traverse at the 2,600 to 2,700-foot level to the Green Creek and the second difficult crossing. The terrain is rough between the two crossings and your elevation will vary. Once you find the Green, climb up alongside the creek until you find a suitable crossing. Once you have attained the other side of the creek, the brush will become a bit thicker, but fear not, you’re almost out! Follow the Green Creek up the drainage while slowly gaining altitude by angling up to the west. The higher up the hillside you are, the less brush. Eventually the brush will begin to fade and you will encounter more and more little open sections. This will eventually open up completely at a slidepath. From here the travel is significantly easier. Continue up the drainage on talus to the base of the Green Glacier at approximately the 4,000-foot level. 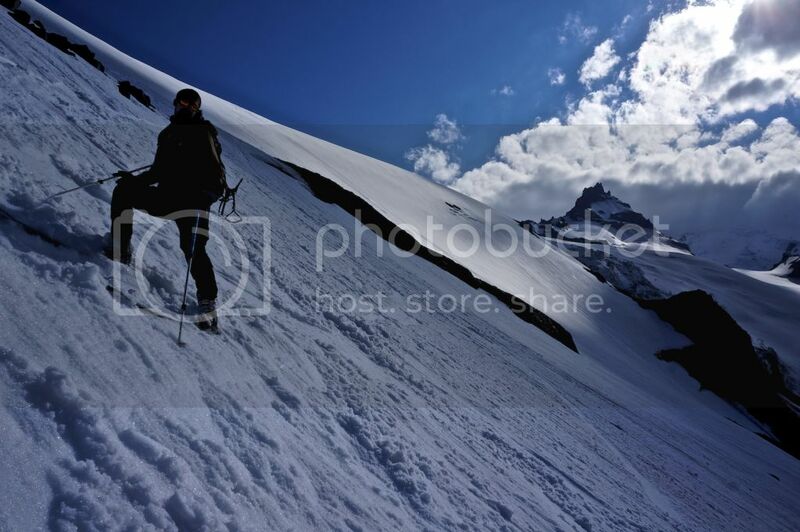 From the base of the glacier, work up the left-hand (south) shoulder. There are a number of flatish campsites at the top of the shoulder at nearly the same level as the climbs (4,800’-5,000’). Parties who are on their first foray into the region will commonly take five-hours for the approach. Those who are on their second or third trips should be able to make the approach in four-hours. A super scenic spire that stands out above the Greek Creek Glacier, the Needle is a summit that just begs to be climbed. Approach: The Green Creek Needle is the obvious spire between Little Sister and Skookum Peak. Work your way up the glacier to the moat. Find a way to cross and gear up. Pitch 1: Scramble up third and fourth-class terrain to the base of a chimney. (90’) Be sure to build a belay station in a place protected from rockfall. Gear: Standard to 3”, it may be good to double-up on small gear. Hopefully you got a chance to see the Perseid meteor shower a few weekends ago! It was an amazing display of celestial beauty. If you didn't, well I have a treat for you. The first video this weekend is a quick time-lapse of the light show above the slopes of Eldorado Peak, which we regularly climb as part of our AMTL 1 Course. 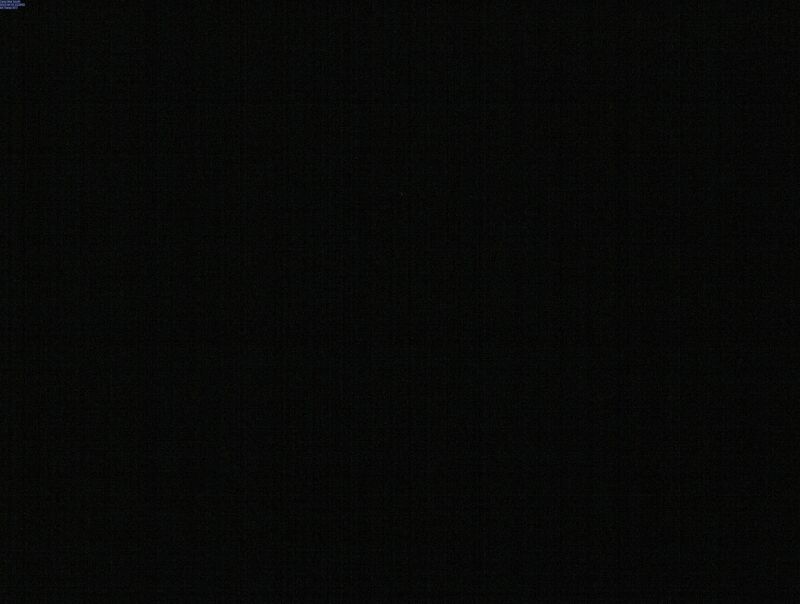 Perseid meteror shower over Eldorado Peak from Erik Turner on Vimeo. This next video from the first in a four part series from Arc'teryx, features Jason Kruk on the Squamish classic "Genius Loci" and delves into the mentality behind the establishment of this route. It has has some really crazy "cable-cam" shots! "THIS WAY" Episode1 - Squamish - Genius Loci from ARC'TERYX on Vimeo. Swiss climber Fred Nicole takes us along for the ride on the first ascent of a hidden gem in the forests. A climber from one of our recent 3-day Baker Skills and Climbs put together this great video of her trip with us. Fred Beckey (with AAI president Dunham Gooding) registering Dan Humphrey of San Franciso in an Alpinism 1 course this afternoon at the AAI office. Waiting for the arrival of Institute guide Everett Chamberlain for a climbing trip to the Selkirks of British Columbia, Fred said, "I don't like just sitting around. Let me do something useful." Considering himself a quick learner, he was indeed a very quick study in this administrative process. When he gets back from Canada, he hopes to meet Dan and his fellow climbers as they come off Mt. Baker. Fred said, "I want to know if my deft work at the computer played a role in Dan's success. Probably will!" Beckey's career spans seven decades and encompasses more notable first ascents than any other climber in the world. His first ascents range from Forbidden Peak in the North Cascades (with Lloyd Anderson in 1940), to the North Face of Mt. 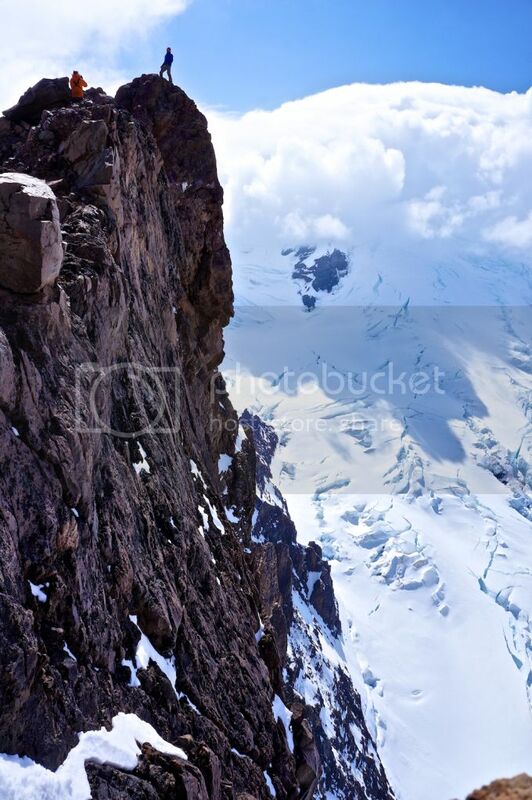 Edith Cavell (with Yvonne Chouinard), to the West Ridge of Mt. Hunter in Alaska (with Heinrich Harrer), to the West Buttress of Musembeah Peak in the Wind River Range (with Layton Kor). This week he's hoping for a new route on one of the peaks north of Roger's Pass. 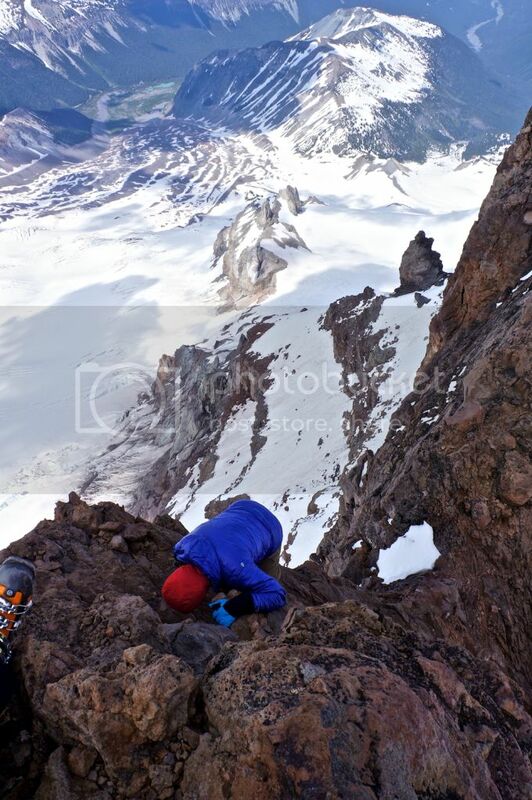 A couple of weeks ago me and a POSSE of boys decided to tackle Little Tahoma. It turns out Little Tahoma, ain't so little. 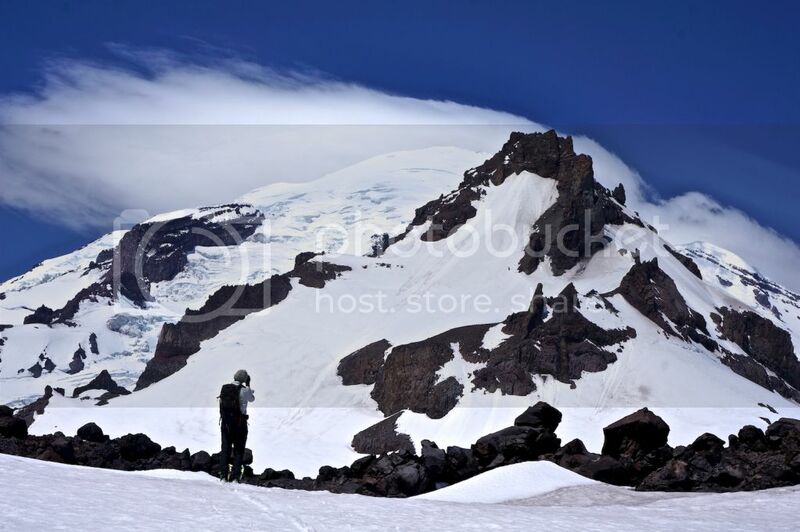 At 11,143 ft it is the third tallest peak in Washington but it is dwarfed by Rainier by it's side. We decided to rename it Medium Tahoma. It has a sick, mildly steep northeast face that is about 2,000 feet long and 45 degrees at the top, mellowing out shortly thereafter. Since I started guiding with the senior guides in Denali still I was loaded with work and was STOKED to get some time off to shred. I was in party mode on this climb, hence my party attire. We parked at the Summerland trailhead in Rainier NP. We hiked about 3 miles in where we gained about 500 feet on soft red cedar bark, boy that was nice. We got to snow after a couple hours and put on our skins. Climbing a total of about 7,000 feet "Little" Tahoma was actually a pretty big day. Bigger than doing Mt. Baker in a day. We got about 6,500 feet of shreddage in. 5.7 move to get to the summit. Super chossy nightmare. The lower portion of the face. The rest of the ski was awesome. 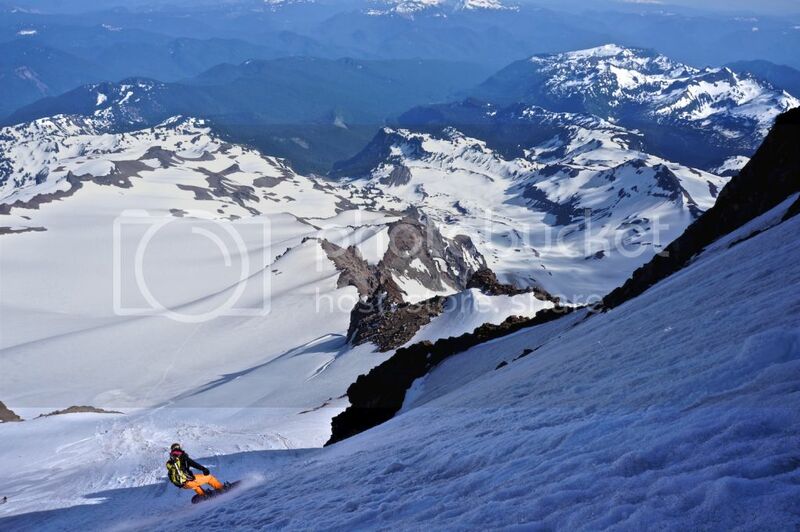 A really direct descent with fun hits, bowls and a nice steep face. Red Rock Canyon Campground will close May 29th, 2012 and will re-open Labor Day Weekend. -- The Red Rock Campground is currently closed and will re-open Labor Day weekend 2012. -Mt Baker: The Coleman Deming route is in condition but with very warm conditions lately crevasses are starting to open up. There were also significant calving events on significant ice falls above the route. While the bootpack is at a distance from these ice falls it is not impervious to them. Climbers should be wary at all hours of the day and night. -Talupus Lake Road/Talupus Creek Trailhead closed weekdays through mid August for logging.